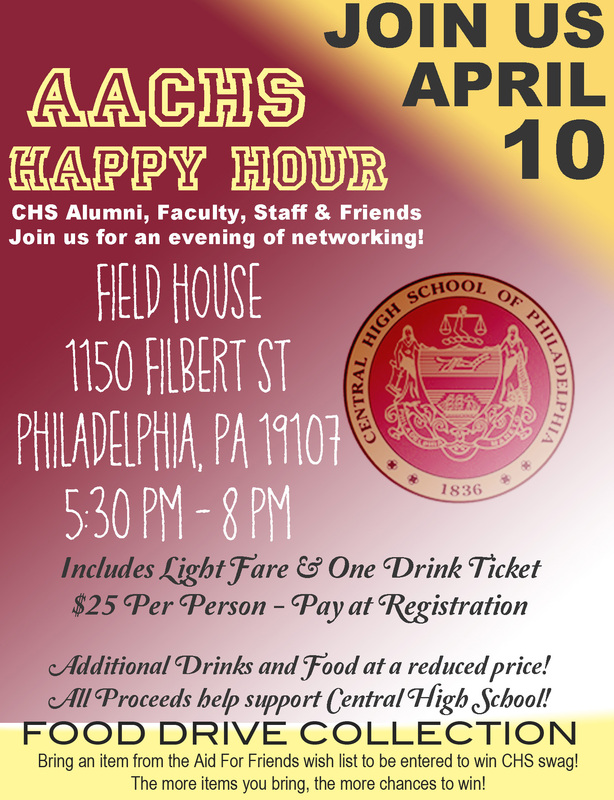 Mingle with fellow alumni at the AACHS Happy Hour on April 10 at The Field House (1150 Filbert Street). At this Happy Hour, we are collecting food drive wish list items for Aid For Friends (https://aidforfriends.org/pantry-wish-list). Meet with board members, and network with schoolmates living in the Philly area! Prices are $25 at the door which includes one complimentary drink ticket and light fare. This event is hosted by the AACHS Programs Committee. We look forward to seeing you there! You are invited to your alma mater’s 17th annual International Day and Multicultural Showcase, an event that has grown into a grand celebration of the school’s diversity. The 211 class is planning a cocktail reception and dinner for Saturday April 12, 2014, at the Hilton Philadelphia City Avenue from 7 p.m. to 11 p.m. The cost is $80 per person, cash bar, with a dress code of jackets please, no jeans. The Central Home School Association invites you to its third-annual fundraiser for Central on Saturday April 26 in Mt. Airy. 8:30 AM Visit to Central, including tours of the school led by students from the 273, and 274. Lunch is scheduled along with the 220th Class, which is also celebrating its 50th that weekend. Lunch will be brought in from Lee’s Hoagies and will include other Philly treats. Your entire family is invited to view the best high school in America. Cost: $15.00 per person. 6:30 PM Dinner with classmates only. This dinner will be at Bistro St. Tropez, the site of the 40th reunion, at 2400 Market St, 4th Floor, Phila. 19103. An hour-long cocktail hour with a cash bar includes hors d’oeuvres. At approximately 7:30 PM, a three-course meal prepared by the chefs at Bistro St. Tropez includes choice of hanger steak or salmon. There will be an open microphone for anyone to get up to talk about their years at Central—and, of course, to suffer the abuse of classmates . Cost: $75.00 per person. 6:30 PM. Dinner and dancing for classmates and guests at The Marriott Courtyard Hotel, 21 N. Juniper St., Philadelphia, PA 19107. A cocktail hour with a cash bar and hors d’oeuvres will be followe by dinner and a DJ, who will play the music of our youth. Cost: $125 per person. If possible, please remit payment now as it will help in paying the deposits to lock dates and places. I have tried to keep the costs down as much as possible, but you only have one 50th reunion in your life and we want to do it right. Class representative Chuck Steinberg (csteinberg@jagermgtcom) will order commemorative golf shirts and hats that you can either order separately or get free if you pay for all three events. The 60th reunion for the 202 will be held the weekend of May 9-May 10. PAST EVENT: Get your tickets now, just $25 each, for the annual Central Night at the Phillies. The Phils will be hosting the Cincinnati Reds, 7:05 p.m. start, and the theme of the night is Irish Heritage Celebration. Social studies teacher Mr. Mike Horowits (251) has the tickets now so email him at mhorowits@philasd.org without delay. The 65th Reunion of the 192nd Class of Central High is planned as an evening dinner with classmates and their companions Saturday May 31, and a Sunday June 1 brunch for class members. Companions will have their own gathering. The events will take place at the Philmont Country Club in Huntingdon Valley, Pa.